Property Info: 3 Bedroom, 3 Bathroom Condo with 2000+ sq. ft. This Fort Walton Beach Condo Home at Presidio Yacht Club has gorgeous sunsets, covered garage-parking, extra indoor storage area – there’s no property like it in Fort Walton Beach – surrounded by elegance and the ambiance of coastal living. Enjoy the amazing views from the spacious balcony or at the pool. This home has upgrades that include, granite counter-tops, tile flooring, high ceilings, crown-molding, a jetted-tub and more. Community amenities feature covered-parking, pool, hot tub, boat dock, media room with theater system, fitness/exercise facility and association owned guest quarters available. Don’t miss out – come and enjoy the best in Gulf Coast living and the spectacular views of the sound and the Gulf of Mexico. Don’t wait until it’s too late, come see this amazing beach home at Presidio Yacht Club Condos in Fort Walton Beach Florida. 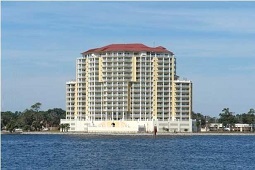 Fort Walton Beach is a fishing and beach destination with a subtropical climate, that has become popular year-round - the busiest time of the year is the summer, with spring break being another period when thousands of people flock to these shores. Fort Walton Beach is a city in southern Okaloosa County, Florida. There is a large selection for Fort Walton Beach homes for sale, from beachfront to bay-front to weekend cottages, there's something for everyone interested in owning a piece of paradise.